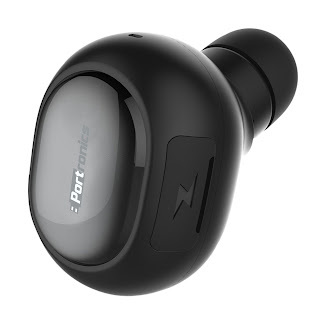 New Delhi, February 23, 2017: Portronics, a prominent leader in the innovative and portable digital product market, has launched “Harmonics Talky” – the smallest and virtually invisible Mini Bluetooth Earbud that can be used both for phone calls and listening to music from paired mobile phones. It uses latest Bluetooth 4.1 version. Harmonics Talky is a very small, stylish, single ear Bluetooth earbud that allows you to enjoy music and also receive phone calls using a built-in mic. 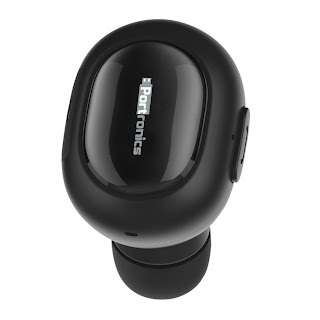 This wireless headphone earbud has 8 mm strong magnetic speaker with Acoustic Echo Reduction technology and Enhanced Noise Cancellation technology to filter out the external noise and enable clearer sound during the calls or while listening to music. The Harmonics Talky is truly a mini Bluetooth headphone with just 18 mm length and a mere 4.9 grams of weight. It has fast & universal compatibility with any brand of bluetooth enabled mobile phones or tablets. It connects with devices within just 0.3 second and upto a 33-feet range. Harmonics Talky can connect with two devices simultaneously with ease. The comfortable, ergonomic and secure fit design that comes with three sizes for all ear shapes and sizes ensures that this Bluetooth V4.1 earbuds stay in place while at workplace, driving, running or carrying out any other sports activity. Icing on the cake is that these Bluetooth earbuds with mic are compatible with IPX2 sweat proof standards. Harmonics Talky provides an impressive 3-hours talk/play time with 70 hours of standby on a single charge. Harmonics Talky comes with 45mAh high quality rechargeable battery with charging time of 1-2 hours. Charging cable comes in the package. Portronics Harmonics Talky is priced at a very attractive price-point of INR 1199/- and is available both online and offline stores. To know more about availability visit, http://www.portronics.com. With a PAN India presence, Portronics has been successfully delivering its products and services across India for over 10 years. For more information, visit http://www.portronics.com/.